When residents are satisfied with dining, they are more satisfied with your organization overall. Residents spend up to 60% of their day focused on meals—either preparing for a meal, going to meals, eating, or returning from meals. Research shows mealtimes are so important to residents that if they enjoy eating in your community, they are more satisfied overall with living there. Satisfied residents are more likely to recommend your community to their friends. 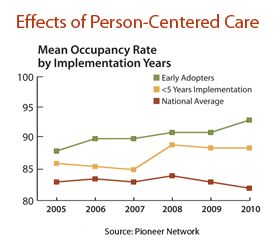 Pioneer Network reports communities that adopted resident-centered care early have benefited from increased revenue, a stronger position in the local market, and more private pay occupancy. Because of the centrality of dining to resident satisfaction, training servers to excel in the dining room is a direct route to a stronger bottom line. Supporting socialization in the dining room creates better clinical outcomes. Offering superb service and choices at mealtime leads to better resident health and well-being. Kathy O’Hara, Registered Dietitian at Villa Crest Nursing Retirement Center recently shared, “Since we implemented Kind Dining® training, residents eat better, socialize more, and have family members come to eat with them. They are not just eating because “the dietitian says they have to;” residents eat because they are happy and want to, and because they have choices about what to eat. We’ve always had low rates of significant weight loss, but now we have no unexpected weight losses—and we’ve accomplished this on a nursing home budget.” Teaching servers to introduce tablemates and spark conversation costs very little, but can dramatically reduce boredom, loneliness and depression, improving resident quality of life. Less staff turnover, more productivity. Staff turnover in senior care communities is high. Often, as high as 70% – 100%. Every time a staff member has to be replaced there are direct costs related to separation, vacancy, replacement, training and orientation. There are also indirect costs such as lost productivity, reduced service quality, broken continuity in relationships, and lost new admissions. At minimum, it can cost $3,500 – $4,000 to replace one CNA. But, training staff has been shown to decrease turnover by up to 70% and increase productivity by up to 230%. – (1). Consequently, the overall financial return on investment can be significant, especially when communities adopt high-quality training with a proven track record and foster a service culture through on-going coaching and encouragement. Building relationships in the dining room is the fastest route to the benefits of resident-centered care. Mealtime serving skills have a tendency to ripple outward to every corner of a community very quickly. Teach everyone in your organization to smile, make eye contact, and spark conversations while serving at tableside and you’ll soon find them using their new skills throughout the day. Raise awareness about the importance of food choices and your staff will have a better understanding of why choices should be offered in all aspects of care. Connections built around the table support better relations in every corner of the community. Within days, the increase in positive interactions between residents and staff can create a more constructive atmosphere. Humans are social beings and we have a strong tendency to bond during mealtimes. In fact, most of us think of our table as the heart of our home, a place to nourish ourselves body and soul. Training dining staff to build relationships one meal at a time means the dining room will soon be the heart of your community’s success.